The High-Frequency-Analyzer HFW35C is customized for use in high-frequency-analysis. The High-Frequency-Analyzer detects electric interference fields, caused by WLAN- WIFI- and Bluetooth-sources as well as microwaves. The High-Frequency-Analyzer was built for detection of electric smog in areas of building biology. The special antenna of the High-Frequency-Analyzer rejects cellular radio- and DECT-frequencies through a steep-flank High-Pass-Filter, which is integrated in the antenna. As a result analysis of frequency ranges between 2.4 and 6 GHz is a more accurate. The High-Frequency-Analyzer HFW35C is also provided with the switch of the professional line for quantitative differentiation between pulsed and unpulsed radiation. 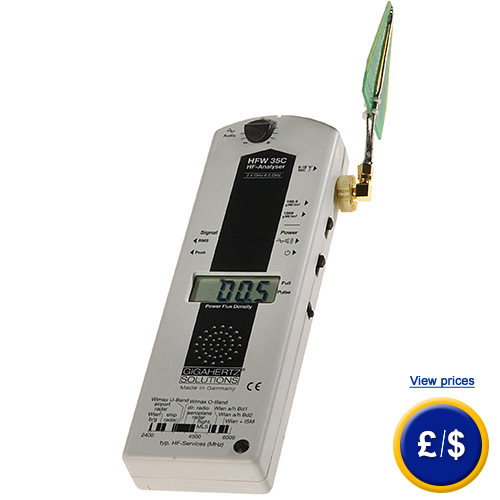 This sound-signal allows an identification of pulsed radiation sources (WLAN,WIFI etc.) as well as the detection of a raised level of pollution load. The High-Frequency-Analyzer is often used by system houses, public authorities and the industry in order to install WLAN-networks. For further information about the High-Frequency-Analyzer HFW35C, please read the following technical data or call our Hotline: UK customers +44(0) 23 809 870 30 / US customers +1-410-387-7703. Our engineers and technicians will gladly advise you on the High-Frequency-Analyzer or any other product in the field of regulation and control, scales and balances of PCE Instruments. - For WLAN, WIFI, Bluetooth etc.